Valldemossa lies 25km north of Palma slightly inland from the rugged north west coast of Mallorca. It’s a pretty town surrounded by mountains though much of its charm is destroyed by the daily bus loads of visitors who arrive on coach trips to visit the Cartuja de Valldemossa. This monastery was the home of the composer Frederic Chopin and his lover George Sand during the winter of 1838-39. In her book ‘A Winter in Mallorca’ Sand described the awful time she spent on the island. Surprisingly the book was translated into several languages and is still widely available in many bookshops. To this day Chopin’s short stay on the island is celebrated at the annual Festival Internacional Chopin de Valldemossa. Getting there is fairly easy by car in about half an hour from Palma. Otherwise you can book onto one of the bus tours that are on offer from the major resorts of the southwest coast. If you’re staying around Alcudia or Pollensa the drive down the west coast is truly spectacular though very busy in the peak months. 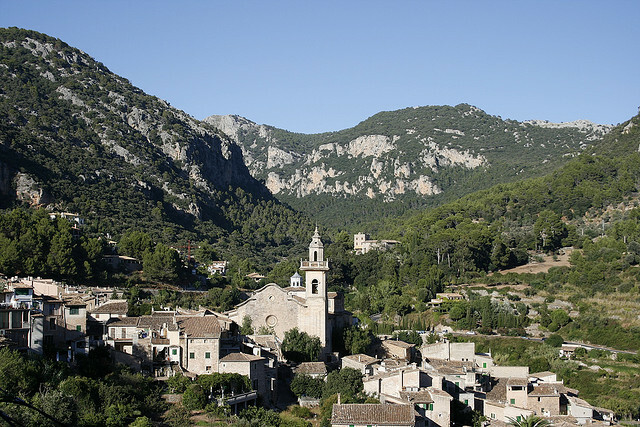 Be sure to also pay a visit to the lovely village of Deià which is only 10km away. This was the home of English poet Robert Graves and remains a popular destination for writers and artists. The town is popular with walkers and Hostel Ca’n Marió (c/Uetam, 8) is a good place to stay as a base. This hostel’s roots can be traced back as far as 1890 is a charming place to stay with a lovely restaurant on the first floor which is also open to non-guests and comes highly recommended. In contrast the magnificent Valldemossa Hotel and restaurant is just down the hill from the town centre. This is a 5-star property developed out of a traditional Mallorcan finca which is one of island’s premier hotels with great private terraces and a lovely swimming pool. Its outstanding restaurant is also welcoming to non-guests. If you do decide to stay overnight in Valldemossa bear in mind that temperatures here can get very cold especially during the winter months so dress accordingly. Other than the hotel restaurants, the town has plenty eateries catering largely for the day trippers. Unfortunately, few of these deserve much ofa mention. One place worth a look even if only for the novelty of it is Costa Nord (Avgda Palma, 6) which is a good restaurant owned by film star Michael Douglas. Costa Nord also offers a virtual reality show which depicts the history of Mallorca as told by Douglas himself. Personally I’d suggest searching out a great little tapas bar called QuitaPenas (Carrero De L’Amargura, 1) where you can try a fine selection of typically Mallorcan delights including Pa Amb Oli and Sobresada with honey washed down with local wines. Heading a kilometre out of town you’ll come to a sign for Port de Valldemossa which takes you on a 6km drive of hairpin bends down to a little bay where you can have a seafood lunch at the Es Port restaurant. The drive’s not for the faint hearted but the reward at the bottom is well worth the effort. The wild sea down here on a windy day is a spectacular sight.